Shakespeare by the Sea (SBTS) will host its fourth annual garden tea party at MaGriffe Galerie in San Pedro on Saturday, April 27 at 2:00 pm. Celebrate the Bard with tea and sonnets in the beautiful garden at MaGriffe overlooking the Pacific Ocean. Enjoy performances of some of Shakespeare’s most moving sonnets read by your favorite Shakespeare by the Sea actors while you sip tea or champagne and savor scones, sandwiches and decadent desserts. The event is a fundraiser for the organization that provides admission-free, professional Shakespeare in communities from Ventura to Orange County each summer. 40 performances are planned for the upcoming season. For its 16th season, SBTS will showcase two plays it has never before produced, King John, a quasi-historical tale of Medieval contest and conquest – and All’s Well that Ends Well, a cautionary story of a young woman whose love knows no bounds. Both plays shine a spotlight on ambition and its consequences, throwing in a characteristic measure of Shakespearean humor. They will be performed in repertory in San Pedro and 19 other locations throughout LA, Orange and Ventura Counties. For the complete summer schedule and more information please visit www.shakespearebythesea.org. MaGriffe Gallerie is located at3624 S Gaffey St, San Pedro. Tickets are $40 in advance and $45 at the door). Click Here for tickets and more information or call (310) 217-7596. Ready for a road trip? 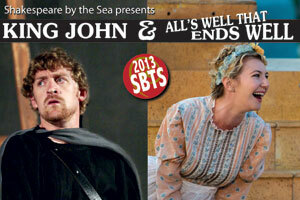 Marin Shakespeare Company in northern California is producing King John the summer. Shakespeare’s tragedy “The Life and Death of King John” is seldom staged, so the current performance at San Rafael’s Shakespeare Marin may be one of the few times you will ever have to see it. Don’t miss it! This play, as directed by Lesley Schisgall Currier, is full of surprises and all the passion, action, wit and betrayal that we have come to know and expect from the Bard. Not only that, it ends on a high note, with the crown of England finally bestowed upon the rightful heir to the throne.